"Conifer's from around the World in Michigan: Arboretum de Concord"
Deep in the center of every tank bromeliad is the future plant: a rosette of tiny leaves which are smaller and smaller toward the center. The center itself, which is covered over by the tiniest leaves, is a mass of cells that are still actively dividing but have not yet become leaf cells. It is the growing point of the bromeliad, also called the meristem. These cells are undifferentiated, that is, they have not yet become either leaf cells or inflorescence cells, they could become either. As the cells of the growing point divide, the plant grows higher. Even though bromeliads grow much more slowly than most other plants, they can, over time, develop very lengthy stems. The oldest growth at the bottom of the stem continually dies off as the plant adds new leaves at the top. When the plant is mature and conditions are right, the cells in the growing point will stop producing leaves: the vegetative phase is over. The cells now start forming a flowering stem or inflorescence. This means of course that the plant will grow no more leaves. (There are a few bromeliads whose vegetation stage is not terminated by flowering because their inflorescences arise from the leaf axils rather than from the central growing point.) Because the growing point has stopped producing leaves it has also stopped producing the growth regulating auxin which prevented the latent growth buds hidden in the leaf axils from growing. One or more of these will now start to grow. In this regard bromeliads vary widely. A few ordinarily produce no pups at all, some begin pupping even before the inflorescence appears, in others it may be weeks or months after blooming before pups appear. The number of pups also varies greatly. Many produce only one pup, others 5 or more. If pups are removed from the mother plant, more pups will soon appear, as long as the mother plant has a few good leaves left. The time required for the pup to mature also varies with genus and species. A few mature in less than a year, others may require several years. If one wants to hasten the production of pups and is not particularly interested in having the bromeliad bloom, one can remove the inflorescence as soon as it is visible. Or, if the mature plant shows no sign of blooming and one wants to get pups going, one can destroy the growing point. Violence done to the tender tissues at the center of the plant is likely to cause rot which can quickly spread to the entire plant. Making sure that the center remains absolutely dry for several days after the operation is a minimal precaution. The growing point which produces leaves and the inflorescence is certainly the most interesting growing point of the bromeliad. Less exciting but equally important to the plant are the other two types of growing points: the growing points of the leaves, where they attach to the stem, and the growing points of the roots, located at the root tips. Each bromeliad root tip is composed of dividing cells (meristem or growing point) protected by a root cap.As the new cells behind the tip become permanent root cells the tip moves forward. Many of the new root cells on the surface of the growing root elongate into root hairs through which the root absorbs water and nutrients. As the root hairs die off, the root tip must constantly produce new ones, growing longer in the process. 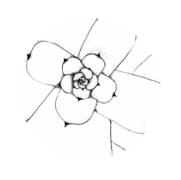 The growing points located at the tip or apex of the shoot and the tips of the roots are called apical. The third growing point is not really a point or apex like the other two. It is a band of tissue at the base of each developing leaf. Since this meristem tissue is not located in an apex but inserted elsewhere in the plant, it is called intercalary. This band of meristem tissue produces new cells for leaf growth, pushing the tip of the leaf further and further out until the leaf has reached its full length. At this point cell division stops. This manner of growth has a definite advantage for a plant with limited resources. If a bromeliad leaf tip is cut off as the leaf develops, the leaf keeps right on growing with no interruption of the plants development. By contrast, if the unfurling tip of a birds nest fern leaf (frond) is cut off, the leaf stops growing, because the growing point has been removed. The plant must now begin over again with a new leaf. But a leaf is most vulnerable at the soft growing point area. This is the area which is most easily damaged by toxins, fungus, animal predators. If you like to pick plants up by the ears, choose an outer leaf which is mature and hardened.